The Community Right to Bid (part of the 2010-2015 coalition government’s enthusiasm for localism) is on the statute book. It allows communities to nominate buildings or land for listing as assets of community value. If these assets subsequently are put up for sale, communities are given six months to find the funding to purchase them. Our businesses are assets of public value, too. We need an equivalent Right to Bid for employees. If a take-over bid is made for a firm, workers there should have the first option of acquiring the business and converting to a co-operative. Radical? Only if you think it is. What a pity, for example, that Cadbury’s ended up part of Kraft Foods when for the last six years we could have been welcoming representatives of the Cadbury’s Workers’ Co-operative at UK co-op events. 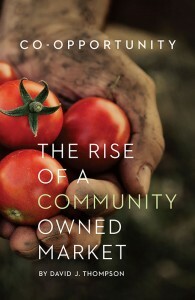 I’ve been going on here about the importance of ensuring the experiences and lessons of the ‘new wave’ of co-ops established in the 1970s are not forgotten, so I’ve been pleased to read a history of one very successful wholefood co-operative, founded in 1974 and still going strong today. The book is written by David J Thompson, a Lancastrian by birth (Blackpool, to be precise) who has lived in the US for all his adult life. David was one of the founder members of Co-opportunity and is a lifelong co-operative activist. It was good to see David at the recent Ways Forward conference in Manchester when I was able to buy the book off him. I’m not sure how it’s distributed normally but I am sure David himself would tell you: his email is dthompcoop@aol.com. Posted on February 22, 2018 by bibbyoncooperatives Tagged co-operative democracy	CommentsNo Comments on What responsibilities do co-op members have? What responsibilities do co-op members have? I want to tackle today what I think is quite a difficult question. It’s this: what responsibility do ordinary members of a co-operative have, if their elected directors are not making a very good fist of things in terms of governance and member democracy? A little while back (and for obvious reasons I’m going to be imprecise and will be fictionalising some things) I went to the AGM of a co-operatively run organisation I’ve been a member of for some time. It has around 6000 members and it operates in the area where I live: let’s imagine that it’s a locally-based consumer co-op. The AGM pulled in perhaps twenty-five members, if you include the directors and one member of staff who was there. So at least we just met the quorum, which was sensibly set very low. You can do the sums: about 0.05% of the members were there. We were given refreshments beforehand, perhaps as a not-very-effective bribe to try to persuade more of us to attend, and then we began the formal business. The accounts (handed out as the meeting started) did not look good and no dividend was possible, but there were perhaps one-off reasons for this. Every co-op can have off years. But more than this, there was a sense of an organisation struggling to get to grips with governance. The chair has been in post for almost as the organisation has existed and he dominated the meeting, including barging in in the middle of the treasurer’s report. He, and two other directors, were re-elected to the board in an uncontested election. I asked some questions, trying to strike the difficult balance of being a responsible member asking necessary questions while at the same time showing that I supported the voluntary board and appreciated their efforts. A few other people asked some questions but mostly we listened. So what responsibility do I have, and what responsibility do my fellow members have? I could of course put myself forward for the board, but I am already actively involved in several other co-op and community ventures and frankly this doesn’t seem like a priority for me. So if I rule myself out in this way from engaging directly, is it enough just to turn up once a year for the AGM? Unfortunately I am prepared to predict that next year’s AGM will be almost a re-run of this year’s. There’s a cold easterly wind blowing over my part of northern England today and Spring, let alone Summer, seems a long way away. But here’s some very early news of an event I’m organising on the UN’s International Day of Co-operatives, Saturday July 7th. The small mill town of Hebden Bridge, between Leeds and Manchester in the south Pennines, has a strong co-operative history, part of which I recounted in my book All Our Own Work which tells the story of the highly successful worker-run co-operative textile mill in the town which ran from 1870 to 1918. I have persuaded myself to run a Co-operative Heritage Walk in the town on July 7th, starting at 11am at the Tourist Information Centre. The walk will last about two hours, and I think we’ll have to end it firmly in the twenty-first century, in the town’s co-operatively run pub, the Fox and Goose. More info nearer the time. Posted on February 21, 2018 by bibbyoncooperatives Tagged co-operative businessCo-operative Business ConsultantsMolly Scott Catopublic ownershipRebecca Long BaileyWays Forward	CommentsNo Comments on Who are the wealth creators? Who are the wealth creators? Last Friday’s Ways Forward conference in Manchester, organised by Co-operative Business Consultants (or to be accurate, organised more or less singlehandedly by CBC’s hard-working Jo Bird) was the sixth such event in what is becoming a regular feature in the co-operative activist’s diary. Two speakers particularly impressed. Both reminded their audience of all that’s wrong with the present economic system – and why, as at least one way forward, co-operative business models need to be nurtured. Molly Scott Cato (the Green Party’s MEP for the South West) stood in as a speaker at short notice and offered a robustly radical appraisal of the issues facing us, while leaving us at the end of her contribution with a sense of hope. I’ve blogged before about the debates which took place towards the end of the nineteenth century – in the co-op world, in the trade union movement and in the fledgling Labour political movement – about business models which could be used to ensure that key enterprises like the railways were run for public good, not private profit. It’s good to see these debates gaining traction again today. Over the weekend at the Labour Party’s Alternative Models of Ownership conference in London both Labour leader Jeremy Corbyn and shadow Chancellor John McDonnell set out their own thoughts on how a future Labour government would tackle this. The conference last weekend follows on from the publication of a report, also called Alternative Models of Ownership, written by an external advisory group for the Labour Party and published last summer. Perhaps because of the General Election, this report hasn’t had the attention I think it deserves. I think its critique of state nationalisation is spot-on: “Older forms of national state ownership in the UK have tended to be highly centralised, top-down and run at arm’s length from various stakeholder groups, notably employees, users and the tax-paying public than ultimately funds them. The post-1945 nationalisation programme set the trend here… the result was that a small private and corporate elite – in some cases the same people who had been involved in managing the pre-nationalised private sectors… – ran and oversaw the nationalised industries”. The debate over how we can create new forms of public ownership is a vital one, and clearly needs input from the co-operative movement. I think there are challenges ahead (trade unions themselves have nasty tendencies to be very centralised and top-down, for example, and not every co-op is a paragon of democracy). But the task of developing new, public-focused, democratic forms of business model is the issue of the day. Co-operative democracy, as I predicted, was much in evidence at the Phone Co-op’s AGM in Sheffield on Feb 3rd. There’s a good report of the event on Toby Johnson’s blog the link to which has been up here on a comment but which I’m mentioning again in case you’ve missed it. The Phone Co-op’s (rather beleaguered) Board has appointed Jane Watts as their chair, someone whose strong record in the co-operative movement should help steady the ship. The Board has also moved quickly to call a Special General Meeting on April 28th, a smart move since if the Board hadn’t done this themselves then dissident members would probably have called for one anyway. It’s still not clear to me whether the Phone Co-op’s strategy for growth – which involves considerably more risk than its way of operating in the past – is rooted on a strong business case or on over-optimism from the Board. But at least all members are being encouraged to scrutinise the proposals carefully. The Phone Co-op remains one of the modern jewels of the co-op movement in Britain and needs to be looked after carefully.